Good evening everyone! I want to start with a big warm welcome to our 2018 Global Leaders New Year Kickoff! Firstly, I want to thank the San Francisco Mayor’s Office, the Chinese Consulate General’s Office, Chinese Enterprises Association and all the other Bay Area businesses and organizations for their support. Thank you to all the guests for joining us tonight, especially our global partners who traveled far to be here. We have an amazing group of global leaders and innovators from the Bay Area as well as an incredible group of Chinese entrepreneurs both from private sectors and state‐owned represented here tonight so please mingle and get to know each other. We have program booklets available with invited guests as well so feel free to grab one of those. I hope with this incredible gathering of people, we can create meaningful and lasting relationships, encourage cross‐cultural communications, and work towards a better future. Almost a quarter-century ago, I first came to the US as a young student, and lived, studied, and worked in the Boston area for 10 years. The openness and innovation of American culture allowed me to excel and rise as a young executive by my late 20s. Having that experience was immense and has forever changed my perception of the world. Because of that, it was the first time I saw myself as a member of an international community. language experts, culture navigators, engineers, content strategists, tech writers, culture consultants, we worked with our global customers and deployed more than 10,000 critical projects in more than 100 different countries. Last summer, I returned back to the states 25 years after I first set foot here, and it is staggering to think about how much the world has changed in that time. The growth in China has been truly phenomenal. At the same time, we have seen such a groundbreaking technological revolution that has grown from here, Silicon Valley over the last couple decades that have fundamentally changed everybody’s lives. And I’m so proud that CSOFT has been a part of this journey. I’m so proud of all the companies that we have worked with, supported, and helped, as this vast technological revolution has taken place. With that said, I am proud to announce San Francisco as our North American Head Quarters. In last week, I flew in 2 dozens of our executives and senior leaders in sales & operations from New York, Florida, Shanghai, Beijing, LA, Shenzhen, Canada… we spent last several days align our goals and putting together a 5‐year expansion plan for NA market. We are aiming for 50% growth in this year, and are committed to aggressive growth in the next 3‐5 years by more hiring and opening more offices. 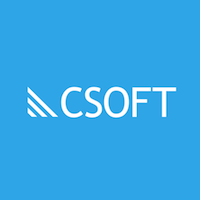 In so many ways, San Francisco is the perfect location for CSOFT to be because it embodies so many of the characteristics we hold dear, so much of what the CSOFT identity is. As a global hub of technology and development, San Francisco really resonates with our commitment to technology and our passion for fostering innovation. The historical visits between past and current US Presidents and China Presidents are evidence of how important US‐China relations are for both countries and their global prosperities. At CSOFT, we too have thought of ourselves as being a bridge between Chinese and Western cultures and markets. Actually, not a bridge. You know, I think ‘bridge’ is the wrong word now because a bridge implies there are two distinct sides, two different parts separate from each other. But the world is too small for that now, and these cultures are no longer so distinct. We are all part of the same growing global culture. You know CSOFT’s network of people come from over 38 different countries. 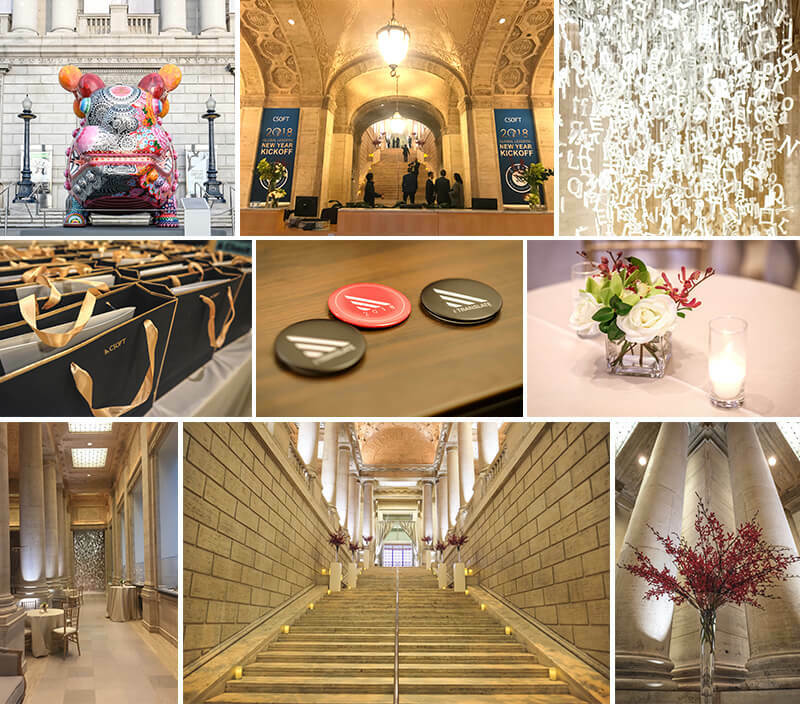 We’re a truly international team and fiercely proud of it, and this is reflected in San Francisco’s incredible history of cultural tolerance and ethnic diversity. For example Philippe, our VP from Paris but lives and works in Beijing. And then we have Josh Hughman from London, but now one of our directors heading up the Shenzhen office, and then someone like Tian who is from Shanghai but now works here in San Francisco. Back to when we first started CSOFT, I didn’t much think about how CSOFT was meant to make a difference. But as the world shrinks and new technologies arise to change the way we live, we see ourselves as facilitators of that communication, of that future. We want to ensure the conversation keeps going, and that the dialogue never stops. It is wonderful to be here at the Asian Art Museum tonight and talk about these things. I have a lot of feelings about this museum. I’ve been here as a tourist as well as attended global conferences as a guest. This space, which used to be a library, symbolizes knowledge, history, and culture, and is also at the center of San Francisco, the “innovation capital” of America and a place known for its diverse culture and forward‐thinking leadership. I feel so fortunate to be able to call this city a CSOFT home too. If you have the opportunity, please take a look around because on display is such a beautiful and emotional history, it highlights to me what is so fundamentally important about dialogue, about talking and sharing of culture. And so as we look back over our shared histories, we can use this to inform the direction of our future. How will we grow together? How will we overcome the shared challenges we face? How can we best leverage innovation and technology to improve the world we are creating? These are the questions we ask ourselves every day at CSOFT, and I hope we can help answer these questions together.